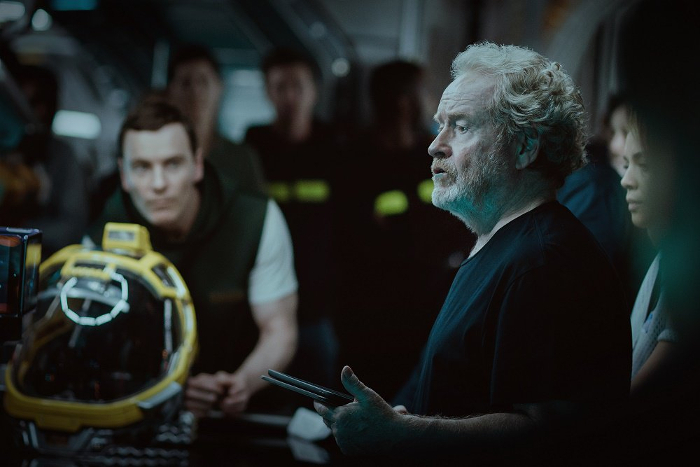 Thanks to the various Alien social media accounts we have a brand new picture of Ridley Scott & Michael Fassbender on the set of Alien: Covenant! Simply captioned “Creator. Creation. ‪#‎AlienCovenant‬” this latest picture reveals nothing of the story. We can see Michael Fassbender in the background, sporting a brown haircut and a completely different hair style to the David 8 we saw in Prometheus. It is likely that this is the “doppelganger” that Ridley Scott said Fassbender would be portraying alongside the David 8 from Prometheus. We get a first half-glimpse at Carmen Ejogo in what appears to be a white top perhaps suggesting a scientific or medical role amongst the crew? We can also see one of the new space costume helmets that Janty Yates spoke about back in December. So that confirms a second David 8, or that's the original. It's the new David 8. Completely different hair style and colour. The woman behind Ridley, is that Carmen Ejogo? Certainly looked like it to me. I had almost forgotten about the second David. As always, the visuals and aesthetics are on point. So excited! Yes, you did point that out. I must have missed that. I like the look of the helmet. Different to Prometheus and The Martian. Looks much closer to the helmets in the original Alien. People forget that David dyed his hair in Prometheus his personality was based on Mr Waylands son which believe was also called David. If I had to take bets I am guessing this android will probably get ghost in the shelled by head found on paradise. Bang Evil David is bad. Definitely looks like they're trying to take that little step towards the Alien design. I like it. Cool. David is one great actor/android. I don't think he's going to turn out crazy evil though. Old school designs Alien style will rock too. I'm hoping we get to see the two Davids interact together on screen. I'd really like to see this factory model opposite whatever Prometheus' David 8 has become. This movie will be good. I know that!